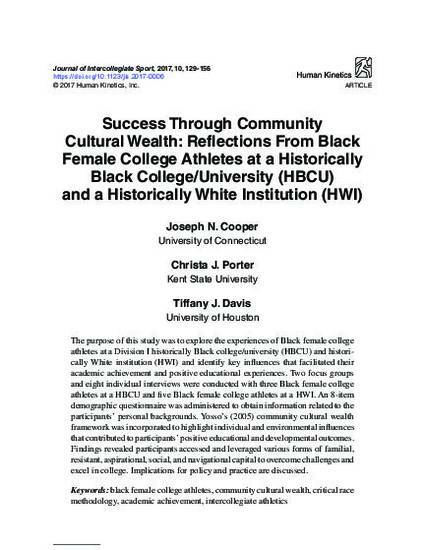 The purpose of this study was to explore the experiences of Black female college athletes at a Division I historically Black college/university (HBCU) and historically White institution (HWI) and identify key influences that facilitated their academic achievement and positive educational experiences. Two focus groups and eight individual interviews were conducted with three Black female college athletes at a HBCU and five Black female college athletes at a HWI. An 8-item demographic questionnaire was administered to obtain information related to the participants’ personal backgrounds. Yosso’s (2005) community cultural wealth framework was incorporated to highlight individual and environmental influences that contributed to participants’ positive educational and developmental outcomes. Findings revealed participants accessed and leveraged various forms of familial, resistant, aspirational, social, and navigational capital to overcome challenges and excel in college. Implications for policy and practice are discussed. Cooper, J. N., Porter, C. J., Davis, T. J. (2017). Success through community cultural wealth: Reflections from Black female college athletes at a historically Black college/university (HBCU) and historically White institution (HWI). Journal of Intercollegiate Sport, 10, 129-156.